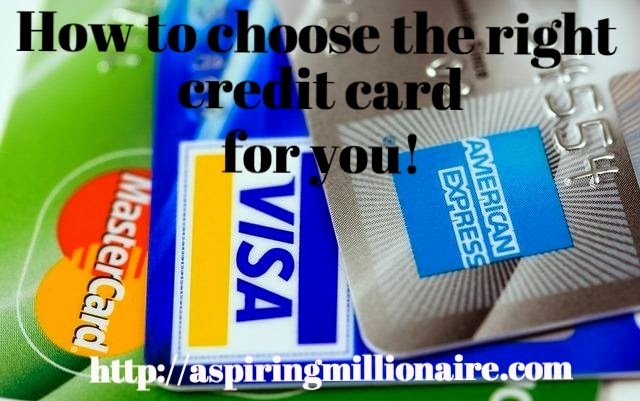 If you are looking at credit cards, how do you know which one is the best for you? With many deals available and different types of cards out there, how do you go about comparing them to get the best deal? What Do You Want Out Of A Card? The first question you need to ask yourself is what do you want out of your card? Do you want a card that has a lot of rewards, a card that has a low interest rate or something that can help you repair your credit? Are you using a card to tide you over a financial hurdle?Answering this question will guide you toward cards that meet your criteria. Annual fees, monthly fees and interest are the three main things you may pay for with a credit card. It is a known fact reward credit cards have higher interest rates, but if you are using a credit card as a financial tool, you should not be paying interest because you will be paying it off in full each month and making it work for you, not against you. This is my favourite way to use a credit card. If you are using a card to get over a financial hurdle you should be using a no or very low interest card, not a reward card. Most cards have annual fees but there are some without an annual fee, some have no annual fee for 12 months and others can be incorporated with your mortgage in a total package. Essentially, if you do your research, pay off your card on time and negotiate or compare you shouldn't have to pay many fees, if any at all. Have a reality check. Are you responsible and manage your money well? Do you know how to best utilise a credit card and will you pay it off in full or are you likely to go on a spending spree when you get it? Check the limit. Just because a bank will give you a $15,000 credit card, doesn't mean you should have a card with a $15,000 limit. Work out the limit you will need and stick to it. Weigh up the benefits/rewards. Compare the various reward programs if that is what you want a card for and get the one that best suits you and your needs. There is not point collecting rewards or accruing points for something you won't use. What else is included with the card, for example does it come with travel insurance? How did you decide which credit card was right for you? I found one with rewards and 0% interest for the first year. Was very happy! I always pay my balance in full before it can accrue interest anyways, though.